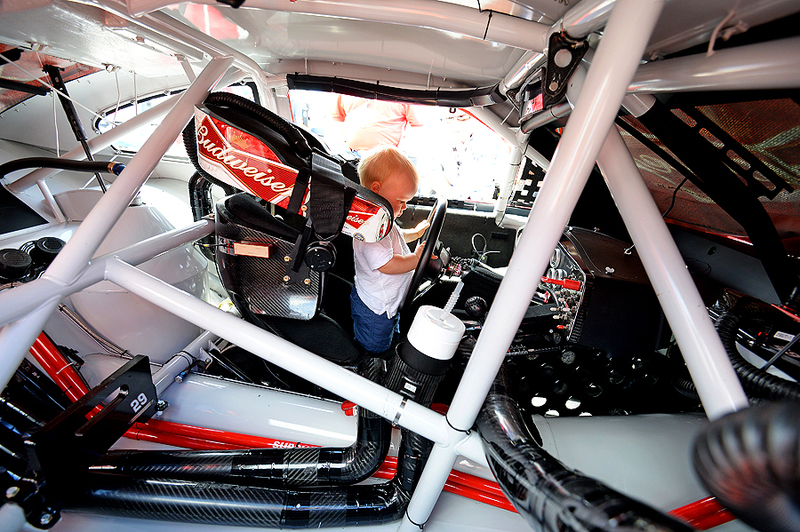 "Keelan Harvick stands in father Kevin Harvick's #29 Budweiser Chevrolet on the grid during pre-race ceremonies for the NASCAR Sprint Cup Series AAA 400 at Dover International Speedway on September 29, 2013 in Dover, Delaware." During pre-race ceremonies there is a lot going on. As a photographer covering the grid, typically I am assigned to a certain driver, but that doesn't mean I am not looking for as many moments as I can nearby. During the Dover race, I was stationed with driver Martin Truex Jr., yet every time someone walked by one of his competitor's cars - in this case Kevin Harvick's car - everyone peered inside the cockpit. Like everyone else, I had to find out what was catching their attention. As I walked up I wasn't sure what I'd see and was expecting some sort of gag placed inside by his crew. To my surprise, it was his son, Keelan, playing in his own world. Standing, not sitting, he tried to turn the wheel and pull whatever levers he could reach. A contrasting moment that when he was replaced by his father, it went from play time to race time. 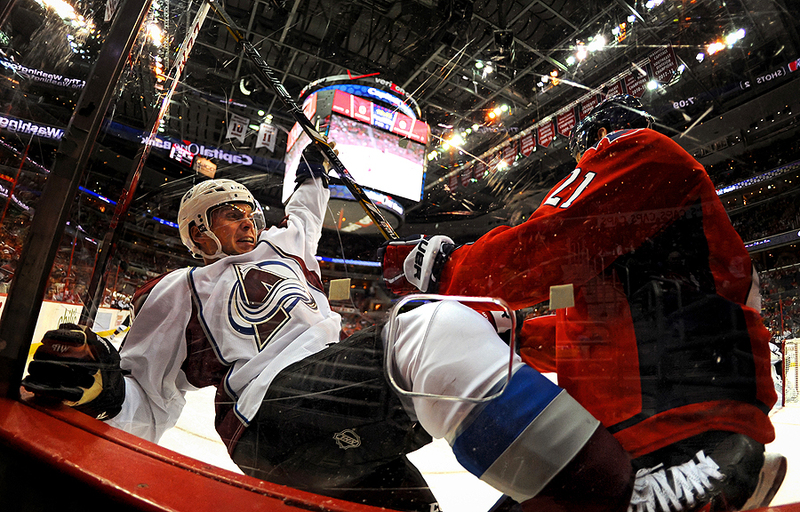 "Andre Benoit #61 of the Colorado Avalanche is hit by Brooks Laich #21 of the Washington Capitals in the first period at Verizon Center on October 12, 2013 in Washington, DC. " Growing up, I was a huge ice hockey fan. In elementary school I knew every single player on the Chicago Blackhawks roster. In addition, I could spit off just about anyone decent in the NHL. To this day, I still can rattle off that era of players without hesitation. The best part of all that was that I never once played hockey, nor have I ever. I also never photographed the sport either - until recently. More than a week ago, for Getty Images, I finally got had the opportunity to shoot a sport I once idolized as a youth and couldn't contain my excitement. The only problem is I have since lost track of most of the players and don't know this new generation of talent as well as I should. Documenting the sport is challenge for sure, but I love the intimacy and speed of the game. It's a much faster pace lacrosse, a sport I did grow up playing. I had a lot fun once I shook my nerves and can't wait to better myself during future games. Thanks to everyone who helped me out the first night, too. Much appreciated. 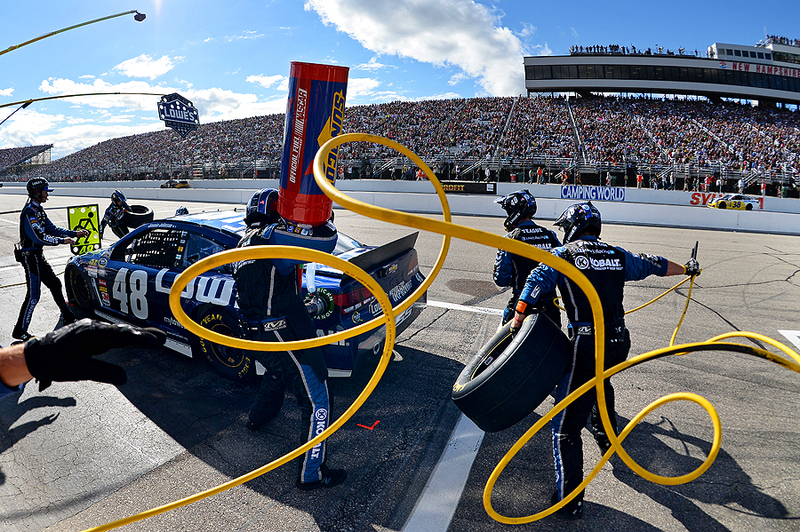 "Jimmie Johnson, driver of the #48 Lowe's Chevrolet, pits during the NASCAR Sprint Cup Series Sylvania 300 at New Hampshire Motor Speedway on September 22, 2013 in Loudon, New Hampshire." Photojournalism is exciting for the fact that you never know what's going to unfold in front of your lens. Even during sometime retouine things, much like a pit stop, you have no idea what could happen. Drivers come in for new tires, a little bit of gas and then speed down the grid to try and come out in first. Typically this is a hailmary type of image, where you don't ever want to get in the way of the pit crew team. Yet you're doing your best to get the images you need both editorially and commercially. It's a tight, small space and it's easy to get in the way if not careful. To my liking, I had a little more room when Jimmie Johnson came into pit. His stall was positioned where there was an opening in the safety wall. As he came to a stop, his crew launched over the wall and their air hose made an interesting untangle wrap of circles. It wasn't until I looked at the back of camera to check images for technical aspects that I was surprised with the above frame. A small victory on the day that gets your adrenaline going. 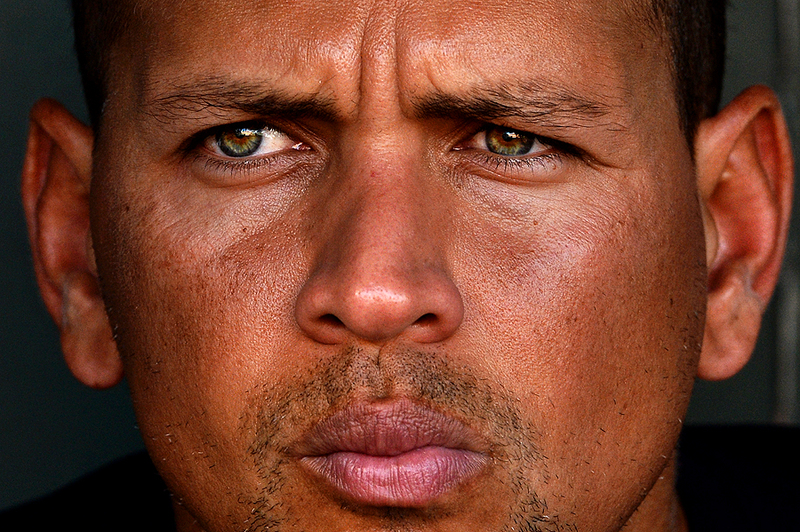 "Third basemen Alex Rodriguez #13 of the New York Yankees looks on before playing the Baltimore Orioles at Oriole Park at Camden Yards on September 11, 2013 in Baltimore, Maryland." Each year I find myself creating my own cliches and continuing shooting them at various events. This year, for some unknown reason been focusing on really tight candid portraits of athletes. There is something about seeing a famous face this close that really draws a viewer in. As a photographer, I don't get excited being so close to these superstars. To me, they're just human. Sure, they're exceptional athletes, but at the end of the day, they are no different than the rest of us. To others, these men and women are idolized. So to get the chance to stare a player in the eyes without the fear of feeling uncomfortable is maybe the reason I've been shooting so many tight portraits this year. 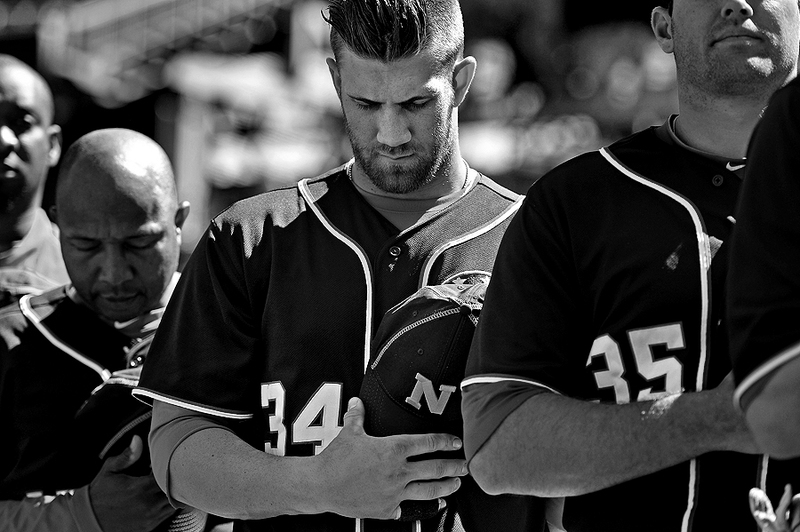 "Left fielder Bryce Harper #34 of the Washington Nationals and teammates have a moment of silence for the victims of the Navy Yard shooting before playing the Atlanta Braves at Nationals Park on September 17, 2013 in Washington, DC." No one likes to see others harmed, including professional athletes. On September 16, thirteen people were shot and killed by a gunman, including the shooter, at a Navy Yard in Washington, DC. This Navy Yard is very close to Nationals Park, so the shock and sadness was felt not only around the city, but inside the stadium, too. Canceling the game the day of the tragedy, before a double header the Nationals held a moment of silence before playing the Atlanta Braves. Wearing and holding Naval Academy hats these players showed support through silence and prayers as a city dealt with somber episode that affected not only the victims and their families, but everyone. The Nationals went on to win in thrilling fashion. A win that held the Braves from clinching the playoffs at the moment, despite them later making, and then falling out, of the post season. "Rev. Joan Wharton poses for a portrait at Evergreen AME Church on August 13, 2013, in Baltimore, Maryland. Wharton, 63, earns a stipend, but no health insurance, as pastor at her church and is looking forward to getting insurance through the Affordable Care Act." Photojournalists may have different visions on how they approach subjects and the world - it is after all a telling art. But one thing we all have in common is being problem solvers. Sometimes assignments are smooth sailing - you get what exactly what was assigned. Other times you're left to do some heavy rowing. I ask a lot of questions; however, there is a fine line with editors. They're busy men and women, and the last thing they need is to be continually bothered that you can't find where you're going, your credential wasn't at the stadium or things are polar opposite of what everyone originally thought. While I didn't need to worry about the aforementioned during this assignment, I did need to improvise. My assignment was straight forward: make calming images of Rev. Joan Wharton. 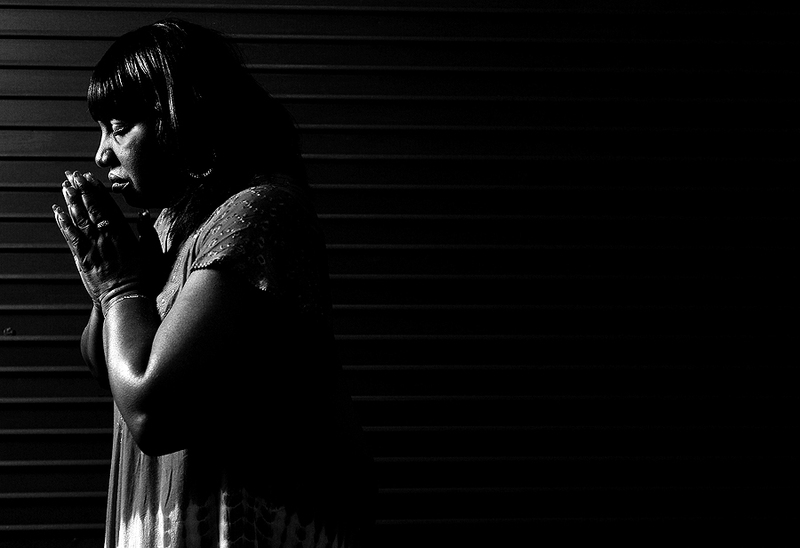 She earns a stipend, but no health insurance, as pastor of her church. But she thrilled to be getting insurance through the Affordable Care Act and I needed to show that in the images. The kicker was that my assignment called for natural light. The problem with that was that Baltimore was hit with a nasty storm all morning - dark and dreary. Not a problem, I could easily make images inside with soft window light. Alas the church had no windows. Being prepared for anything, I artificially lit my subject in a few different areas of the small church. In the end, it strayed from the original idea, but conveyed the same mood, story. This is a prime example of problem solving being a necessary tool in every photographer's bag. "(Left) Carl Edwards, driver of the #99 Aflac Ford, sits in his car in the garage area during practice for the NASCAR Sprint Cup Series Sylvania 300 at New Hampshire Motor Speedway on September 20, 2013 in Loudon, New Hampshire. (Right) A view of cars racing during the NASCAR Sprint Cup Series AdvoCare 500 at Atlanta Motor Speedway on September 1, 2013 in Hampton, Georgia." There is nothing more healthy than being a part of a team and friendly competition. This year, I had the amazing opportunity to be apart of the Getty Images NASCAR team. Traveling across the country, I covered about 15 stock car race weekends. These weekends included: multiple races, editorial and commercial work. Most of my short career, I've been a single identity as a freelancer. Picking up assignments and working alone. However, as an athlete, and having older brothers, I've always thrived being apart of a team. Functioning as a team player and working collaboratively were some of the first fundamentals of life I was ever taught. Being able to be loyal to a group of photographers, editors and finding a permanent team is what I'll always be chasing in my career. Having teammates to lean on for support - during and after work - is not only rewarding, but an indescribable high. Getting the chance to be apart of this squad is an honor. It's humbling to get the chance to work alongside the best photographers, editors that not only push your own imagery, but everyone on the team - it's a without a doubt a two-way street. From personalities that lift your spirits, to incredible documentary images, to having work praised and axed - it's all a blessing. It's an enriching experience to see how teammates approach the same subjects and take this sport, as well as others, to the next level visually. While we're all friends, we are all still chasing the best pictures, but know that our hard-work, trust in one another results in the same common goal - a powerful package of imagery. I cannot thank the team enough for the support and good times. Since I've covered my last race of the year, I decided to pair some of my favorite images of the year. The best to my teammates as the season comes to a close in November.